The range of the python includes Africa, Southeast Asia, Australia and Madagascar. Pythons make their homes in rain forests, savannas, grasslands, swamps, woodlands, shrublands, desert sandhills and rocky outcrops. While many pythons are seen in trees, often they don’t attack from above, but rather spend much of their time in the water. There, they lie submerged with their heads above the water, waiting to ambush a small mammal or birds that wanders near the edge of the water. Two types of pythons, including the black-headed python and the woma, create burrows by using their heads to dig into the ground and the curves of their necks to scoop out the dirt. 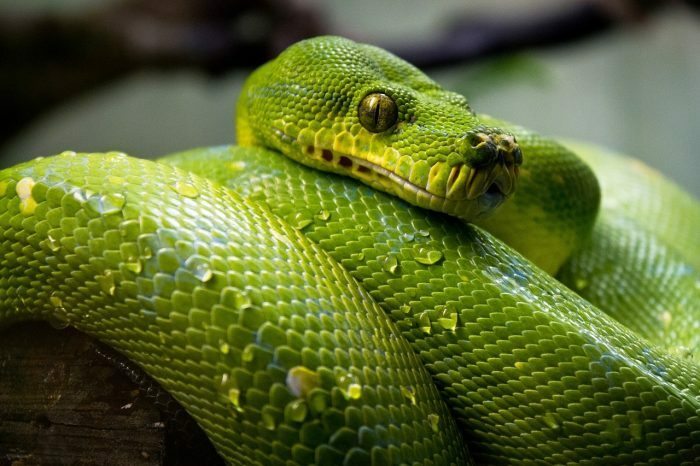 The green tree python, pictured above, is found primarily in the rainforest and most often resides in tree or bushes.